I am always on the hunt for the perfect red. I was especially obsessed with the color popping up in J.Crew catalogs. I knew I had to have that color and so did many, many women. J.Crew heard the call and our wish was granted. They introduced their first color by famed lipstick guru Poppy King. 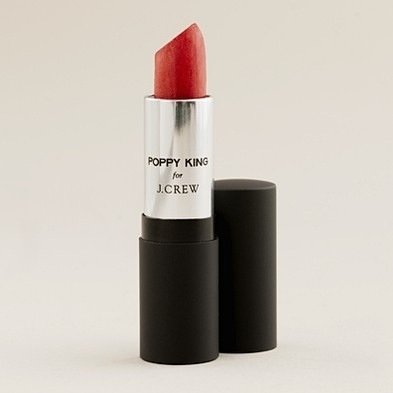 It is called, quite simply, Poppy King for J.Crew. I pre-ordered mine in August for a September delivery but it arrived much sooner than expected (yay!). I love it! It is the perfect coral red. It’s formula is non-drying and long lasting. I love it so much I picked up a few more tubes at their Southdale location. And good thing I did. It quickly sold out. But fear not! You can now pre-order it on-line for a January delivery. I suggest you order more than one because you will fall in love. I’m always intrigued by red…it looks fabulous, but always wonder if it works with all skin tones/colorings. I’m not one of those COOL/WARM/FALL/SPRING people. What do you think? I think you can pull it off. The color is becoming known for looking great on almost everyone!